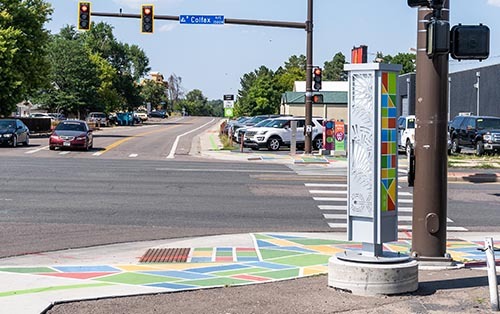 Harlan St. at W. Colfax Ave. 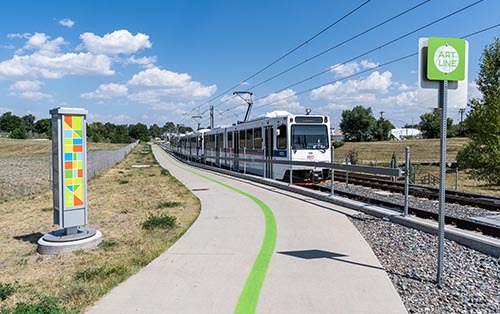 There's one iconic sculpture in each park on the ArtLine: Mountair, Aviation, and Walker-Branch. These three sculptures, created by PUNCH, are the most significant on the ArtLine and inspire wonder, interaction and exploration. 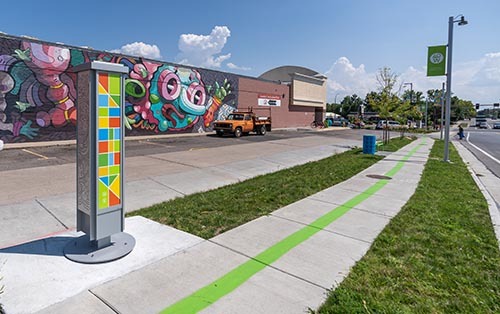 PUNCH created “interactive, memorable, and playful” sculptures based on discovery and excavation of Colorado’s state dinosaur, the stegosaurus (first fossils found just southwest of Lakewood). 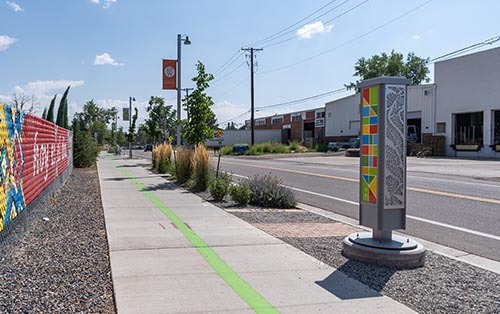 The sculptures include kinetic, functional and earth art installations – the types of art most desired by the community based on extensive input early in the project. 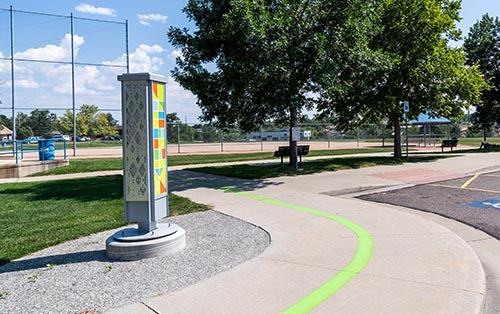 The Kaleidoscope Crossing ground murals, located at ten intersections, utilize the ArtLine pattern logo brand as creative wayfinding to guide visitors along the route.This element of the project was very organic and community-driven. 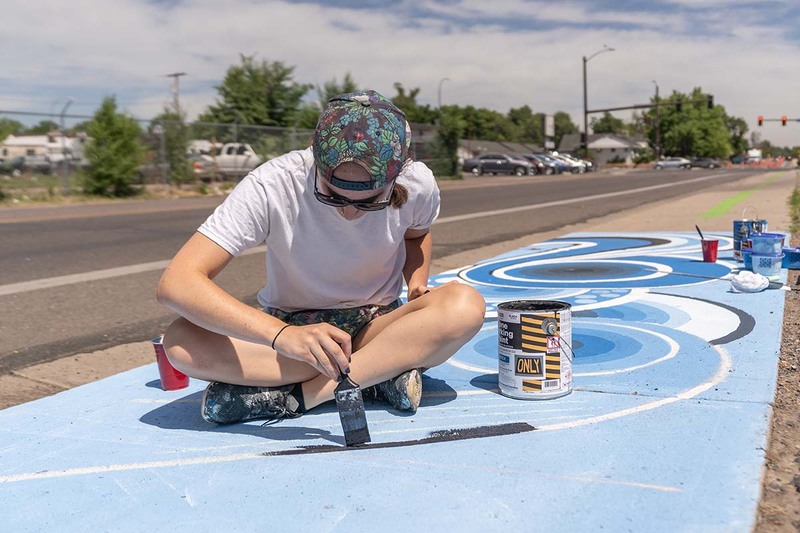 The name Kaleidoscope Crossings was developed by members of the 40 West ArtLine Champions group and dozens of community volunteers worked with artist Carlos Fresquez to help create the murals. 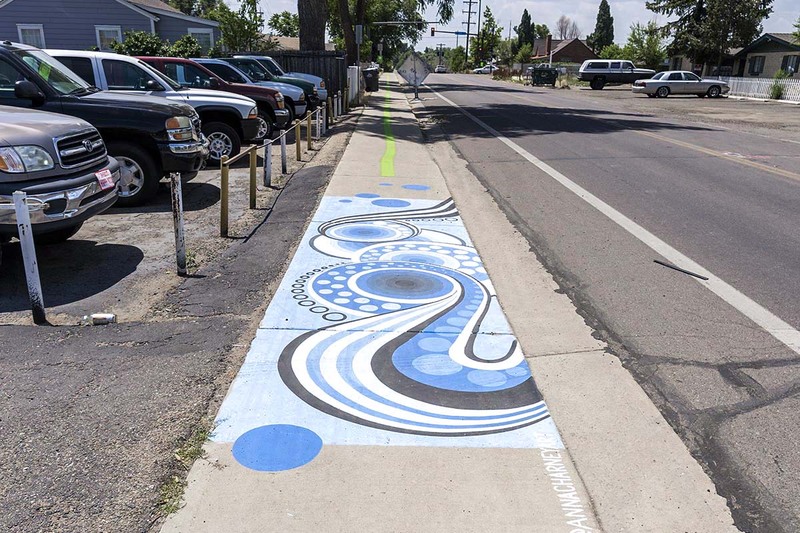 "For this ground mural, I created a fun, bold and graphic design that would catch passerby’s eyes as they walk along the ArtLine. I used dot patterning and stripes to create flowing compositions and expansive compositions." Can you spot all 11 hidden dinosaurs? 16th Ave. & Teller St. This first story totem near 40 west galleries and at the beginning of the ArtLine represents the birth of creative ideas taking flight. If you look closely, you’ll find something prehistoric has also hatched. 16th Ave. & Reed St. 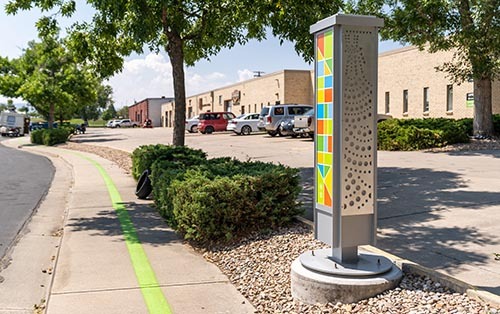 The proximity of this totem to 40 West Studios makes it ideal for the theme of imagination. A stylized Ankylosaurus radiates ever expanding rays of circles and the ancient is reimagined anew. Reed St. north of 17th Ave. Inspired by the Unearthed Plates art installation, this story totem incorporates graphic plate shapes with a Stegosaurus hidden in the “ground” below. 17th Ave & Pierce St. The wide open fields of this location are a perfect site for the immense, plant-eating Diplodocus. Pierce St. & Lakewood Pl. 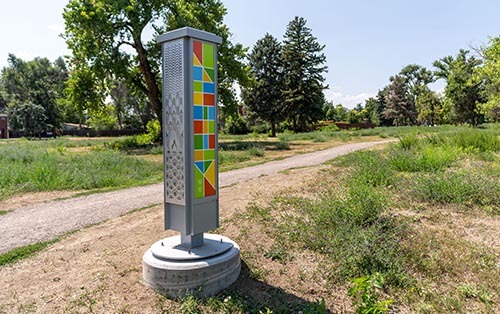 To compliment the sound installation art piece and hearken to the area’s dance hall and musical history, this totem features a musical theme and hides a Dimetrodon with its large neural spine sail. Colfax Ave. west of Lamar St.
Recalling Colfax Avenue’s history as an automobile thoroughfare, this retro 1950’s atomic design motif has also captured footprints of a much earlier passerby. 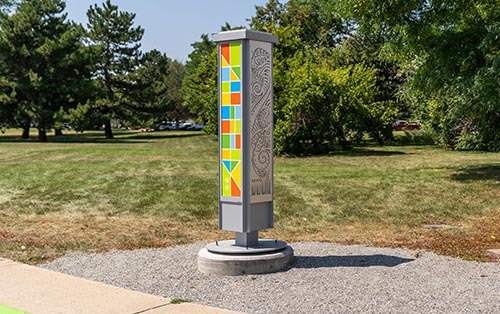 This totem combines the mosaic style used in the trunks of the nearby Lakewood Legacy Trees Artwork at Lamar Station to hide a flying Pteranodon. No dinosaur hunt would be complete without the discovery of a T-Rex! Due to his large size, however, only part of his head and small hands may be visible, hidden within the design. 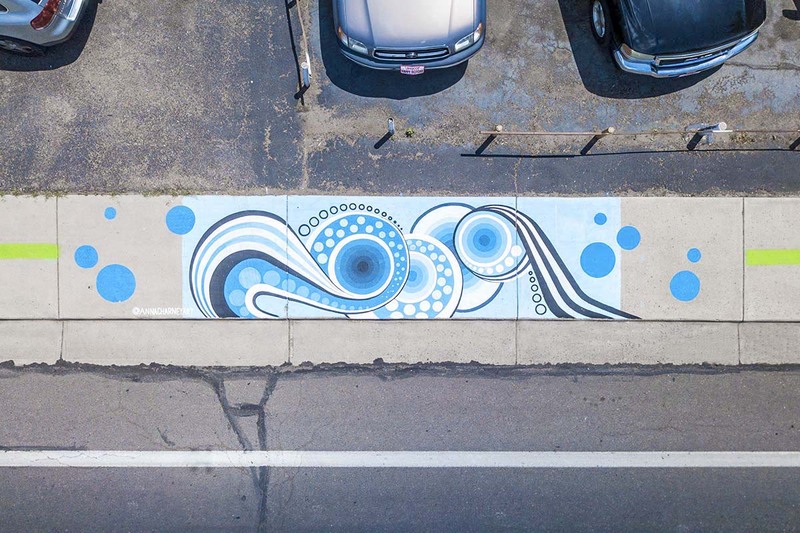 An abstract earthen motif highlights the history of the Two Creeks neighborhood. 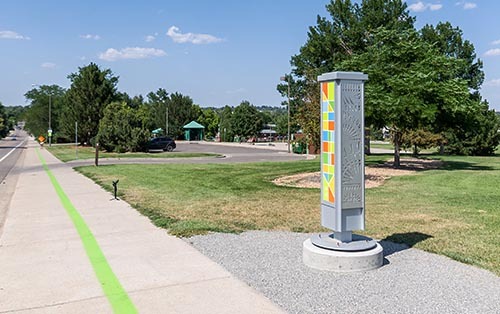 Connecting the Dermal Plate Gateway artwork at Mountair Park and the nearby baseball field, this totem uses gradated diamond patterns to hide a triceratops. 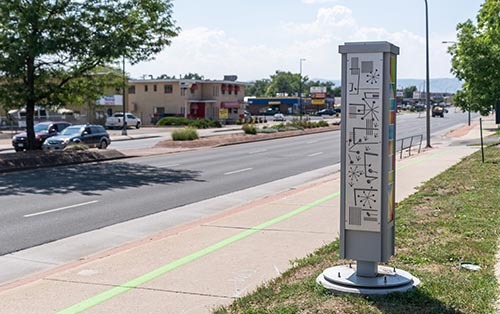 Harlan St. & Colfax Ave. 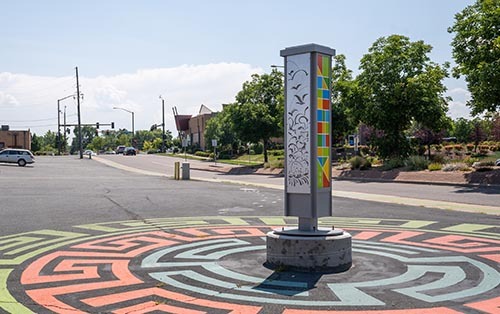 This totem incorporates movement and abstracted transportation references (rail, bike and car wheels) to tell the story of Colfax Avenue’s history as a major thoroughfare and hide a Dimetrodon with its large neural spine sail. The Stegoskel sculpture in Walker Branch Park inspires an abstract interpretation of dinosaur bones.